Oh, these are the kinds of things that I do when I’ve been watching too much HGTV and Animal Planet! I’ve long been a fan of the show Treehouse Masters and a really fascinating guy named Pete Nelson who—with a crew of extremely talented carpenters—build the most amazing treehouses. Not treehouses like the kind you had as a kid, but true works of art that just happen to be up in the air. So tonight while watching I started thinking about my dream job building treehouses with Pete Nelson. Since they’re in Washington State, I’m guessing that dream will probably never happen. But I could still make a treehouse charm! Inspired by Pete’s wonderful Fall City treehouse, I created a little charm in ZBrush. I haven’t really paid attention to the castability…this was more of an exercise. It involved a lot of subtools, and a custom chain. The main treehouse was created out of a Cube3D primitive, trimmed using the Clipping function. The deck was extracted from another cube, drawn freehand with a lasso mask. I’ve kept all of these subtools separate…for example, I may resize the trees to make the volume of the two trees on the left more closely match the tree on the right so it would sit correctly. 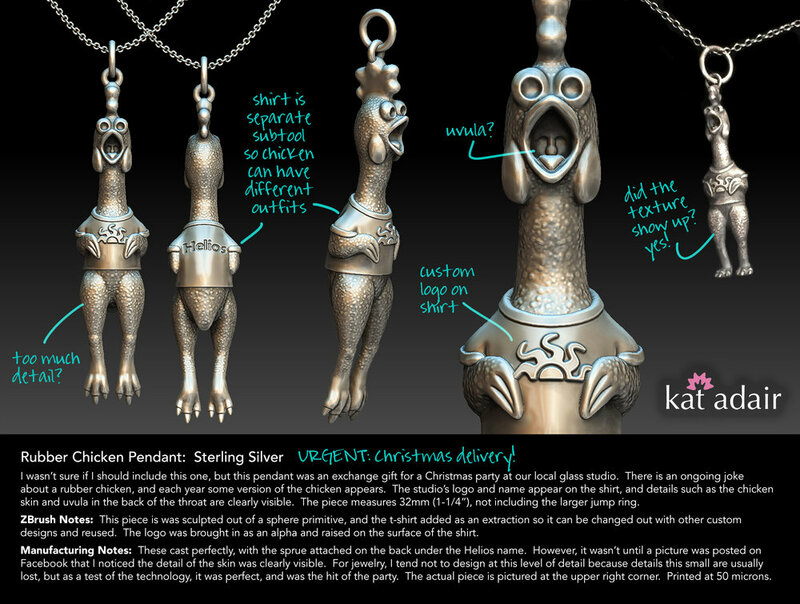 Still not sure how I would sprue this puppy for casting, but it may make its way to my printer in the next few weeks. And who knows? Tonight’s episode featured Pete and the guys here in Texas building a treehouse near the Frio River. I’d even volunteer for free if he ever needed help here in the Lone Star State. I have tools and a tent and a ukulele! Well, here we are again, and I took a couple days’ break to unwind from the remodel of my parents’ house. Mind you, I’m having a lot of fun working with an awesome group of guys to rebuild the SEVEN decks at this house, but we’ve got the main deck done and we’re working on the railings. A bit more work on the inside, and we’ll be ready to put it on the market. It’s been a long journey—over two years to clear out the house and do a major remodel. Anyway, tonight I took a moment to record more ZBrush videos, and then my mind started to wander as I looked for more objects to model into jewelry. I absolutely love scuba diving, and swimming with a whale shark is definitely on my bucket list. I’d found my next model. I started out with a sphere primitive and used the “Snake Hook” brush in ZBrush (shortcut “BSH”) to sculpt the form. I then used “Dam Standard” to create the ridges down the back, and the “IMM Primitive” brush with a sphere to add the spots. I will apply a patina, then the raised spheres should polish out and give the effect of light round dots. Or they might look like tiny polka-dots…sometimes when designing a small charm, you lose sight of what the larger model on the screen may translate into once it’s printed. So it’s 1:14 a.m. the morning after Christmas, and I just wrapped up. I’m heading to bed. But I just wanted to share this awesome little guy I sculpted this evening. When I finally get back to my studio and start 3D printing and casting again, he’ll definitely be in the next batch. And then I’ll have to go find a real one to go swimming with. Facebook has done more damage than good…and I dumped it! I like designing fabricated or cast jewelry with custom glass cabochons, which can be done pretty easily in ZBrush. After creating your pendant through whatever means you’d like…sculpting, hard surface modeling, the easiest method is to create a separate subtool that represents the stone. It can also be done with a separate polygroup, but my preference is the separate stone which can be duplicated and different cabs tested. In the image above, the first piece features a cabochon created from a pâte de verre (glass paste) test tile from the fabulous Alicia Lomne’s class I took last October. The second example is a slab of fused glass that I created a few years back that I cut into cabochons, and the final one is a piece of Fordite. Never heard of Fordite? It’s a manmade “stone” from the drippings of automotive paint from factories, and it is sparkly and beeeautiful! You can actually tell the “vintage” by the colors of paint in the layers; for example, a piece of Fordite from the 1970s will look totally different than a chunk from the early 2000s. Anyway, your setting for your stone can be as simple as a bezel from one of my bezel tutorials, and create the matching cabochon. I’ll make a video tutorial here shortly to make the pendant above, which was made using the Project Primitive tool, which can be found above the Gizmo 3D in the Move mode. Moving on…the key here is to apply a material to all subtools before you begin. While in the Draw mode, choose the M button to the left of ZAdd. This enables your material channel. Next, choose MAHmc_Shiny from the Materials picker on the left, then from the Color menu, choose FillObject. If you’ve loaded my custom interface, there is a button on the left under the color pickers for this function. Now go to the cabochon subtool, and pick a material such as SketchShaded3, then click the FillObject button again. This will assign the material to the cab before we load the texture, giving you a clean slate. Now, switch to the Rgb channel. Go to the Texture picker on the left side of the canvas. Choose Import at the bottom, and load your texture. Choose a brush that you don’t use often—I use the Clay brush since I usually use ClayBuildup if I’m sculpting. Switch FocalShift to -100, which will prevent the texture from being blended around the edges. Choose DragRect from the Stroke menu, which will allow you to click on the model and drag to resize the texture. Make sure that the desired texture is loaded under the Texture selector. Click on the cab and drag to apply the texture. You can resize and rotate as needed. To view your piece in all its glory, Choose Best from the Render menu. If you’d like to save the image, go to the Document menu and choose Export. 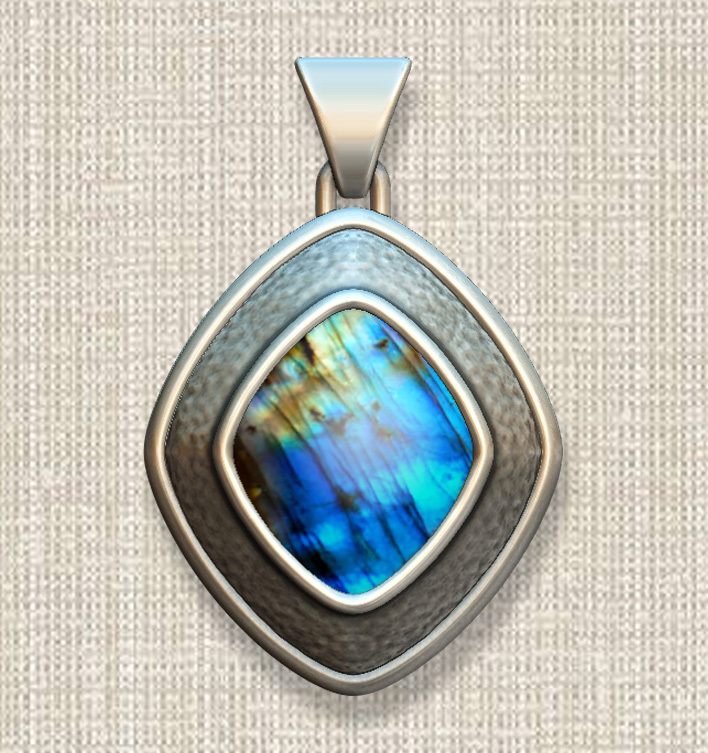 If you’d like to try different cabochon styles, duplicate the cab under the Subtool palette. Use visibility to turn the different cabs on and off, then export each one. 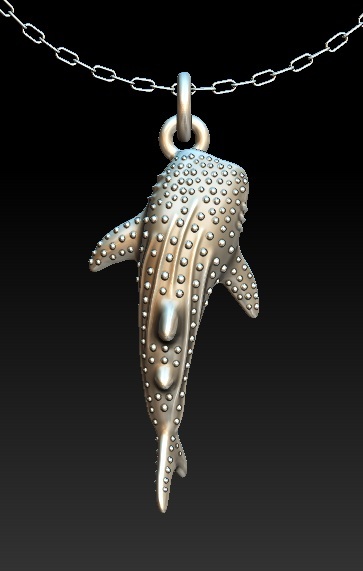 If you’re a graphic designer and want to place your pendant on an alternate background like the image above, you’ll use a “mask” to block out the background in ZBrush. To create a mask, use the BPR render button on the upper right-hand corner of the canvas, then go to the Render menu, look for BPR RenderPass, and look for BPR Mask…click the button and name the file “[whatevername}_mask.psd. Immediately after generating the mast, make sure it’s set for a “Best” render under the Render menu, then export the image again. If you’re unfamiliar with how to use a mask in Photoshop, do a quick search online for “Using alpha channels in Photoshop.” This will allow you to have a version of your ZBrush jewelry without a background, ready to insert into a custom background. (2) Ocean Jasper cab image from eBay seller waly-beads. (3) Crazy Lace Agate image from Silverhawk’s Designer Gemstones. I haven’t blogged in awhile because I’ve been remodeling my parents’ house. But while preparing a portfolio piece for a jewelry company, I made a series of sheets that show the design process of some of my more recent work. Click to download the PDF of this file. So how did I make this little guy? I started with a DynaMesh Sphere from the Lightbox, then turned off Perspective. I used the Gizmo 3D in the Move mode to stretch the sphere into an egg shape. Switch to the Draw mode. Using a mask where the neck should go (Cmd on Mac, Ctrl on PC), I reversed the mask (Cmd/Mac, Ctrl/PC and click on background) and used the Gizmo 3D “ball” in the Move mode to pull the neck out. Since your primitive is already a DynaMesh, after each major change, re-DynaMesh to refresh the mesh. If you want to see what’s happening, on the right side of the main canvas look for the PolyF button with a grid on it. Using the same method, turn on Symmetry under the Transform menu, then you can mask off both legs at once in the Draw mode, then switch to the Move mode and use the Gizmo to pull the legs down. Try using the Snakehook tool to pull out things like the toes on the feet…play around with the size. The shortcut for Snakehook is B-S-H on your keyboard. Switch to the Clay Buildup tool for sculpting details…a good tip is to turn your intensity down to 5 so it doesn’t apply much material, which is easier to smooth with the shift key. The keyboard shortcut for Clay Building is B-C-B. The arms were masked off, mask reversed, then pulled out to each side. Try using symmetry to do this, but you will need to move the Gizmo to the general vicinity of one of the arms…when you pull out to the side, it will “raise” both arms at once. To move the Gizmo, hold down Option/Mac or Alt/PC and drag the Gizmo over the masked area for one of the arms, release the key, then use your mouse to pull the horizontal arrow away from the body. Clear the mask and fine-tune with sculpting. To re-center, click on the third icon above the Gizmo to find unmasked center. Another trick? After masking, you can hold down the Cmd/Mac or Ctrl/PC and click ON the model to soften/blur the edge of the mask. This will provide nice, rounded arms. And finally, the t-shirt was applied to the chicken using a mask and the Mask Pen. Try switching the stroke to Lasso if you’d like. Sharpen the mask by clicking on the model while holding Cmd-Option/Mac or Ctrl-Alt/PC. Then use the Extract command from bottom of the SubTool palette. I’ll do a tutorial on this one soon, but hopefully this will get you started! I've been out of touch for a little bit as I took on a pretty big project that's completely unrelated to jewelry. If you read my bio, you might have seen that I have a background in construction (of all things!). I've been in the middle of a major remodel of my parents' house, getting it ready to go on the market. If you can imagine, popcorn ceiling removal, paint, a new multi-level deck, and a total re-do of four bathrooms, including moving walls. If you've ever watched that show Fixer Upper, it's kinda like that...except for unlike the show, it doesn't happen over the course of an hour. Yup, size can be a big issue when working with ZBrush. While I don't have a formal answer why, I'm guessing that it's because the program was designed to make things that were abstract—things that lived in a virtual world. So for that reason, size is relative in ZBrush, and measured in plain ol' units. Here you can see the Size sub-palette under the Geometry palette on the right-side of the interface. The pendant on the stage (only the pendant, not the chain), is a minuscule amount smaller than 25.4 units. Well, if you count this as 25.4 millimeters, this equals one inch across. You can also see the Z Size is 1.61 units, so approximately 1.61 mm thick, which is a nice thickness for a pendant. And likewise, the height is 16.7 mm. When I first started working with ZBrush, I saw a tutorial that suggested calibrating something called the Transpose Line tool. I struggled with this, and every time I thought I had the size correct, something would change and everything would be off. I couldn't reliably gauge bezel cups or stone settings...or even thicknesses. This also became an issue with the amount that a design or text was raised off or inset into the surface. So finding a way to make this work was really important. Someone also asked me on YouTube if I used a plugin called "ScaleMaster." The answer is no. I have also tried RingMaster, another plugin, which is nice, but I also had some problems with that. However, I DO use RingMaster to insert gemstones because the models contain minimal polygons, meaning they don't slow ZBrush down. From the right-hand side of the stage, click on the yellow "S" that represents the SimpleBrush tool. Choose the Cylinder3D from the list. Click and drag a cylinder on the stage. It doesn't matter how large you make it...it comes into ZBrush at an XYZSize of "2" units. Immediately press the "T" key to switch to the Edit mode. Press the Make PolyMesh3D button toward the top under the Tool palette. Look under the Geometry palette on the right-hand side of the window for the Size sub-palette. Enter "10" in the XYZSize box and hit return to accept the new size. The primitive is probably taking up the whole window, so click somewhere on the stage to deselect the number in the XYZSize. Now press the "F" key to fill the stage with the current object. And there you have an object on the stage. It's pretty faceted, and not smooth, but we'll deal with that next. I have a special technique that I've developed to get a smooth object as soon as possible in the workflow. In the beginning, I thought simply performing a DynaMesh operation would smooth it, and I went back and forth between DynaMesh and Polish Features, but with results that weren't efficient or acceptable. So here's how I smooth things out. Look for a button labeled Divide from the Geometry palette. Make sure that the Smt button is turned on (this will smooth your primitive). Click the Divide button twice. Look above the Divide button for another button labeled Del Lower. This will delete the two lower-resolution subdivisions that you just created. That should give you a nice, smooth primitive. So what happened? Each time that you use the Divide command, ZBrush takes each rectangular polygon and divides it into four polygons. Then when you divide again, it divides each one of those resulting polygons into four more polygons. If you have the Smt button activated, it takes the opportunity to smooth out your model. You can see the underlying geometry of your model by using the Draw PolyFrame (Shift - F) button to the right of the stage, toward the bottom of the vertical row of buttons. Subdivisions are wonderful if you're roughing out a shape, then switching back and forth between lower resolution subdivisions and higher resolution subdivisions. Adding material with a brush like the ClayBuildup brush works faster when working with a low resolution. But finer details are better applied with the higher resolution. I'll address this in a tutorial later. Take a look at the example below...look at the pixillation of the cylinder and the number of ActivePoints. Each time that the cylinder is divided, it QUADRUPLES the number of ActivePoints. This has implications with regard to file size...our strategy is to get a smooth resolution while still keeping the file size down. So keep this in mind, and I'll write a little more later...then we'll talk about how working in actual size relates to your DynaMesh resolution. and how you can work more efficiently and on lower-end hardware. 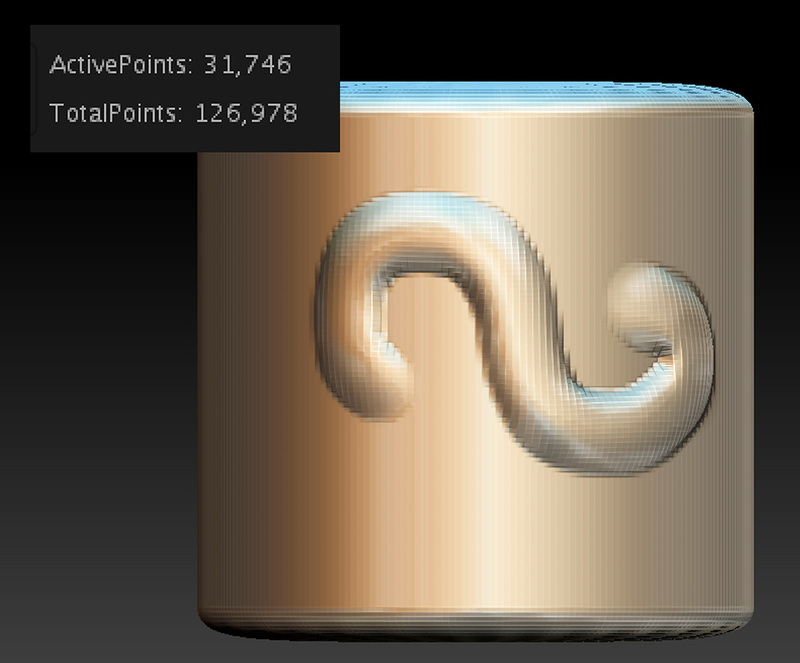 Heck, I can even run ZBrush on my 2012 MacBook Pro! And you know what that means? I can sit in a café in the Caribbean and design jewelry. SWEET!